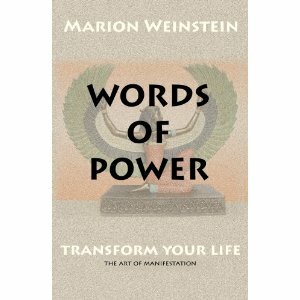 If you have any interest in conscious manifestation, the power of positive thinking, the principles of magic, personal empowerment, or working in accordance with the principles of natural law, then Marion Weinstein’s Words of Power is a must read. Her perspective is inclusive of any religion, and although the ideas behind her writings are Pagan-based, I think that non-Pagans will easily relate to her examples and ideas. · You can create anything. · The use of words allows us to transform and manifest in accordance with our will. Words of Power are the precursors to prayer but they do not rely upon a Deity or external Power Source to succeed. They are often called ‘affirmations’ but do not give away or diminish our personal power. When we consciously choose new phrases, we are speaking words of power and changing the reality. For example, we once called a specific group of people crippled or handicapped, now we recognize that those people are not deficient, but instead physically challenged. The new phrasing is empowering, not diminishing. This perspective of personal empowerment was very much a part of Ms. Weinstein’s life, from her emergence into the public eye in 1978 with her seminal book Positive Magic (recently re-published by New Page Books). I was one of her early readers, and can say without embarrassment that she changed my life, much of what I am comes from her teaching that transformation is not only possible, it is easy to accomplish. That it is available to everyone, regardless of religious convictions or socio-economic status. Ms. Weinstein had two missions in this life: to remind everyone of their personal power and ability to make positive transformations – always for the good of all and according to free will – and to make witchcraft a lifestyle, not just a religion. Words of Power, her last book before her death on July 1st, 2009, expands on concepts she first discussed in Positive Magic. With clear examples, and straightforward writing, Ms. Weinstein provides us with everything we need to change our mental habits and begin to manifest our will in reality. I know, that sounds like something from a fast-talking, over-promising infomercial. But time and time again, we see that thinking positively leads to a happier outlook on life. Optimists live longer, are healthier, and report a higher quality of life than pessimists . The ‘magick’ Ms. Weinstein shares with us is simple and will not backfire or go astray, if only because it relies on a positive outlook, and the recognition (and neutralization) of negative thoughts. She can be dogmatic, and may irritate some readers with her unrelenting positive perspective. Every magickal working, for example, is accompanied by the phrase “for the good of all” or “or its equivalent.” To some that may feel like an avoidance of personal responsibility; others may see that as a request for Divine intervention to prevent unintended or harmful consequences. Overall, however, Words of Power is a book for people interested in doing better, being better, and feeling better. From information found at: http://stress.about.com/od/optimismspirituality/a/optimismbenefit.htm. Written on November 22, 2009, accessed on January 12, 2010.
originally printed in SageWoman Magazine.